It's not a done-to-the-nines decorator bedroom, but Miranda Brooks's understated bedroom, as featured in Bright Young Things, is one of the most magical I've ever seen. 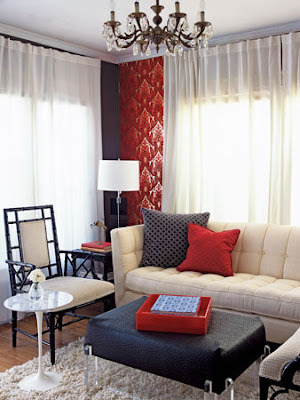 The tall mirror and large chandelier are the elegant star players; simple curtains and a bedspread with embroidered red poppies by Brigitte Singh bring warmth and charm. 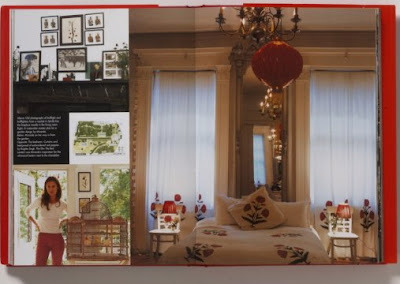 Brooks says her whimsical red Chinese lantern was inspired by the film, The Red Lantern. But I've never been able to track down a movie with that title -- only Raise the Red Lantern. The latter 1991 movie is considered to be among the most visually stunning films ever made -- and the plot revolves around red lanterns and bedrooms -- so it seems logical to me that this could be the title Brooks meant. But I've always wondered. Does anyone know the 411? Above, a Charlotte Moss-designed apartment photographed by Paul Costello for the April Domino. 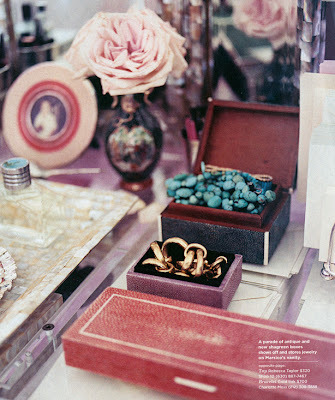 When it comes to creating a sense of feminine luxury, Charlotte Moss is the master. If you had one chance to work with a dream decorator, would you choose a hot wunderkind or a seasoned pro like Moss? 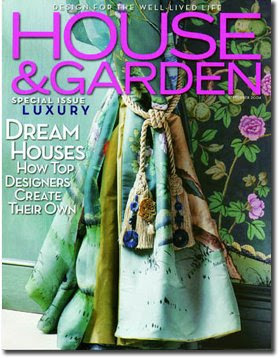 Shown above, September 2004 House & Garden cover featuring de Gournay chinoiserie "jardinieres & citrus trees" on dark blue dyed silk for the walls and curtains in Charlotte Moss's dining room. There's so much buzz about the opening next month of The Charlotte Moss Townhouse, a sumptuous retail emporium located in a five-story Manhattan landmark. Aside from shopping, and Design Atelier offerings such as custom-colored silk wall panels from de Gournay, the Townhouse is expected to offer inspiration. I've always thought the close-up image of Moss's own de Gournay-swathed dining room, above, made for one of the most striking House & Garden covers ever. When it comes to decorating, Vanessa De Vargas seems to have no fear of commitment; She selects a narrow pallet and never wavers. Her technique of using neutrals such as her beloved grays, black, and soft whites, punctuated with hits of red or yellow, is beautifully captured in the April issue of Sunset Magazine. In her petite 500-square-foot bungalow in Venice, California, Vanessa channels Dorothy Draper, injecting modest digs with fresh glamour and luxury. Be sure to pick-up a copy of the magazine! 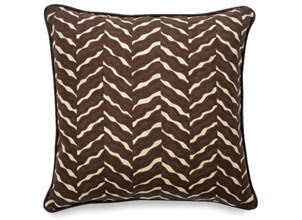 Seacloth's 18" square, linen/cotton blend pillow with down insert and a hidden zipper closure, in the "flutter" pattern, is now available for retail purchase, online, $110. Brown or red. Thanks Petite Tresor for tipping us off to Seacloth's new online shop! 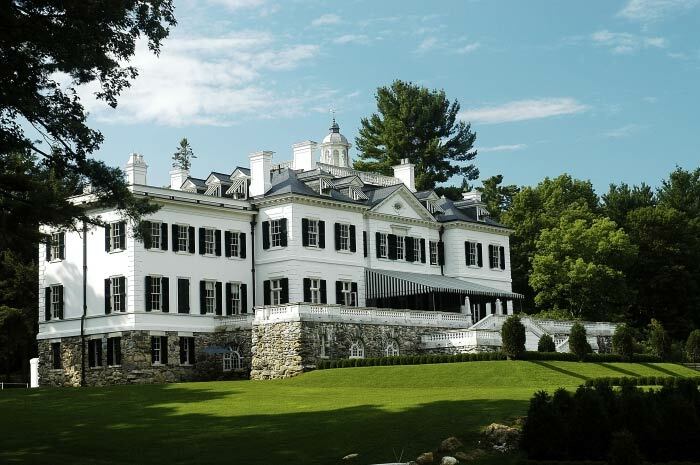 Edith Wharton's Morocco is a special tour abroad offered by The Mount, a cultural center that preserves Edith Wharton's former Massachusetts home. The study tour is scheduled for October 13-25, 2007 and is designed to retrace globe-trotting writer/decorator Wharton’s 1917 journey through Morocco. Highlights will include admission to private palaces and gardens, the red and white cities of Rabat and Salé, and Marrakech. Cost is $7,500. This month Rizzoli is publishing another re-issue of Wharton's 1897 book, The Decoration of Houses, co-authored with architect Ogden Codman, Jr.
Domino's April feature on Schuyler Samperton put me in the mood for pattern and antiques, so on Saturday I stopped by Interiors Market. The warm, clear colors and relatively simple geometric pattern of this rug, spotted in a stall there, really grabbed my attention. The dealer believes it's an Oushak. Speaking of Turkish rugs, an interesting exhibition that explores the impact of Near East style on Venetian art and design, Venice and the Islamic World, 828–1797, opens March 27 at The Met. 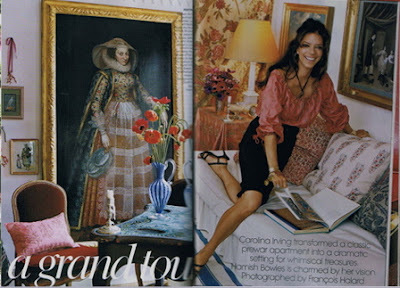 I really flipped for the complex mix of exotic patterns in Carolina Irving's apartment, photographed by Francois Halard for Vogue, October 2006, as shown above top. 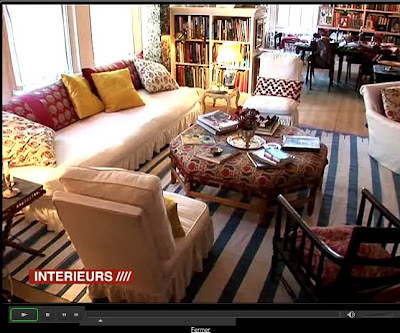 So, I was thrilled to recently discover a detailed video of Irving's apartment featured on a French site called Interieurs. Here's the link: "Chez Carolina." One tedious thing: registration is required to view the video and the site is entirely in French, but if you like textiles, Indian block prints and globe-trotter chic, the extra time is worth the effort. The second image above is from Interieurs. 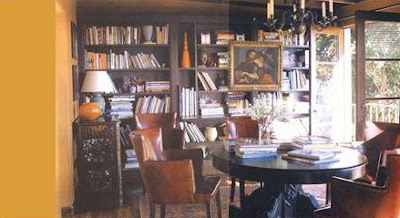 Above, one of my favorite rooms of the decade, a library/dining room designed by Tim Clarke; photographed by Grey Crawford and published in Elle Decor, May 2002, as well as in Hollywood Style, by Diane Dorrans Saeks. 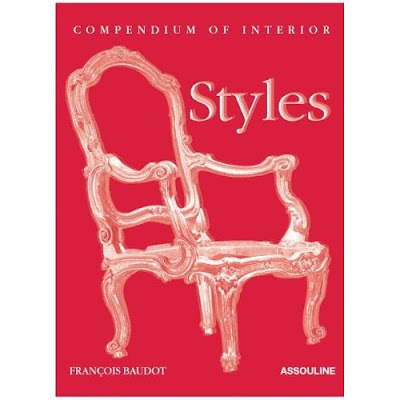 Compendium of Interior Styles is another book I plan to keep forever. Weighing about six pounds, this gargantuan resource offers a whirlwind tour of interior design history, from the Medieval era through the twentieth century, using iconic residences such as Versailles and Monticello as illustrations. I especially appreciate how the author, François Baudot, shows how one period of design morphs into the next, and how styles return. 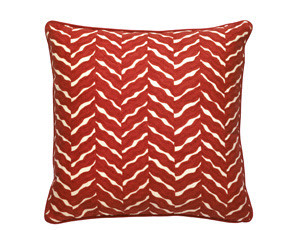 Lovelier and more graphic crewelwork pillows just keep coming from Anthropologie. Above is the isola bella pattern in tomato. 20" square. $68. 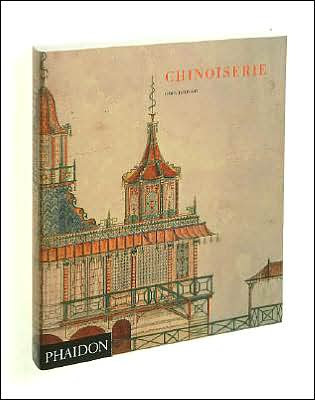 If, to save space, I ever have to decrease my collection of design books, Dawn Jacobson’s Chinoiserie is one book I won't let go. For me it functions like a colorful, exquisitely illustrated encyclopedia of decorative arts. 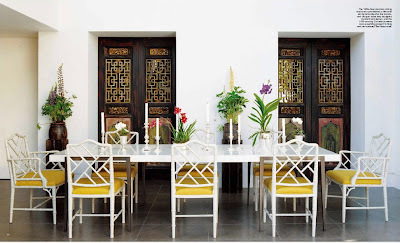 The glossy lacquered furniture, the delicate hand-painted wallpaper, the fanciful garden follies – it’s all here in Jacobson’s coverage of the West’s 600-year love affair with Chinese-inspired design. Another book that has become a surprisingly good resource is Hollywood Style, by Diane Dorrans Saeks. For a long time I passed over this one because I assumed it focused on movie stars. Actually though, the emphasis is on L.A.'s top designers, with a few landmark residences such as Tony Duquette's Dawnridge and Frank Lloyd Wright's La Miniatura in the mix. Saeks highlights the full range of L.A. style, from layered classics to the sleekest modern houses, disproving the myth that L.A. has no design legacy. Among the included designers are Tim Clarke, Peter Dunham, Michael Smith, Suzanne Rheinstein, Kate Stamps, Martyn Lawrence-Bullard, Patrick Dragonette, Rose Tarlow, and Kerry Joyce. Also featured are two Kelly Wearstler-designed hotels, Maison 140 and Viceroy Santa Monica. 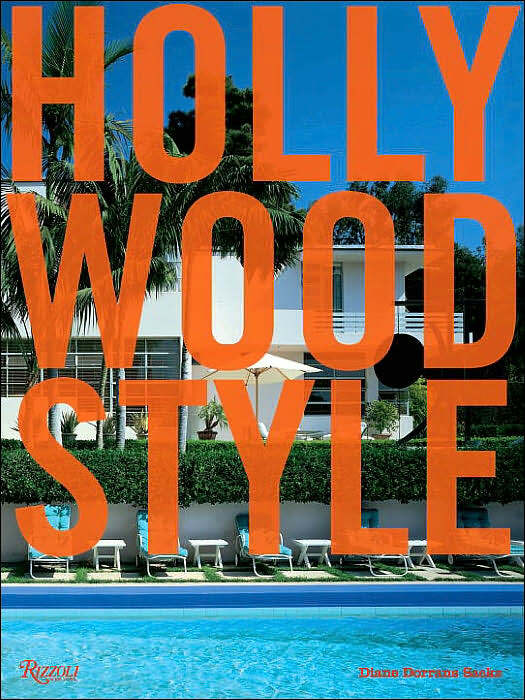 It's true that quite a few of the homes and commercial properties in Hollywood Style have also been featured in Elle Decor, and even in other books, but I love having all of the beautiful photographs from Tim Street-Porter and Grey Crawford together in one easy-to-access place. Speaking of design books, Atlanta fans of high-voltage color king, Jamie Drake, author of Jamie Drake's New American Glamour, can meet the interior designer on Thursday, March 22 from 6 to 8 p.m. at Deadwyler Antiques, 49 Bennett St. Drake will discuss mixing contemporary art with antiques RSVP: 404-351-3941. 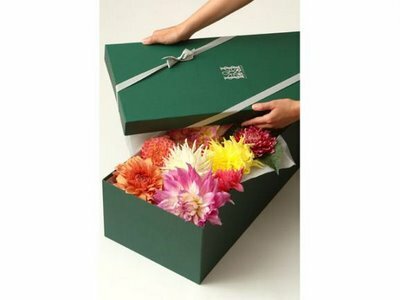 I've mentioned L.A.-based boutique florist, Lily Lodge, before but since I've been immersed the last few weeks in lectures, films and books about French 18th-century style, I've been thinking about the shop's design as well as Lily Lodge owner, Ariana Lambert Smeraldo's approach to flower arrangements. 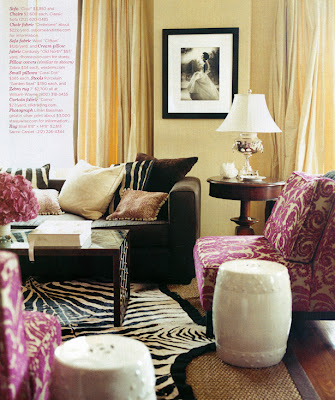 The way those refined French chairs are mixed with earthy elements, like the antler-ish chandelier, rustic coffee table and animal hide rug, shown below photographed by Jeremy Samuelson for Elle, August 2005, makes me think of Marie Antoinette's take on "country chic." Also Lily Lodge's soft, romantic old school arrangements in precious porcelain vases remind me of all the sumptuous flowers used in the film Marie Antoinette. BTW: A helpful related resource is The Private Realm of Marie Antoinette. Hennessey + Ingalls, the West Coast's largest art and architecture bookstore, is a great resource if you are trying to find a rare design book. 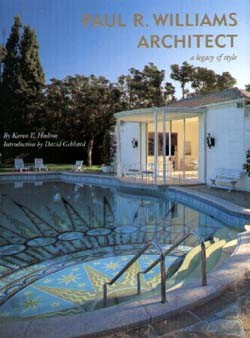 Today on the store's site I spotted the out-of-print "Paul R. Williams Architect: A Legacy of Style" for a very reasonable $35. Above, the Orangerie at Versailles; Below, I love classic Versailles style box planters like this one sold by Mecox Gardens. 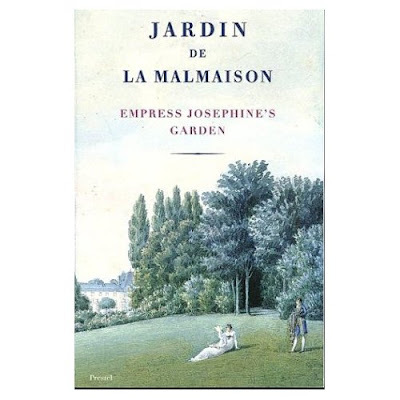 I spotted this beautiful book, Jardin De La Malmaison, in Anthropologie and thought it would be a perfect Mother's Day gift -- for a mom who is passionate about gardening or interested in Malmaison. Unfortunately, it is pricey; depending on where you buy it, the book retails from about $120 to $180. For a smaller $35 fee, the High Museum of Art is offering a seminar on French landscape design and decorative arts, this Saturday, March 17 from 9:30 a.m. to 12 noon. The House of Bourbon: Exploring the Tastes of the French Monarchy, will be led by French historian Dr. William Beik of Emory University. 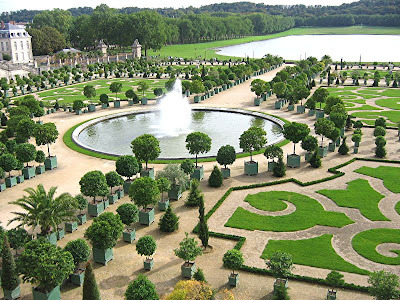 Landscape designer, Christian Duvernois, will also discuss the gardens of Versailles. Pre-registration is required and check-in is at 9 a.m. I'm disappointed I have to miss this event. The first three in the series have been great -- especially the talks with Caroline Weber and Joan DeJean. Above, a sample of the colorful hand-knotted Turkish rugs available through Allan Arthur Oriental Rugs. 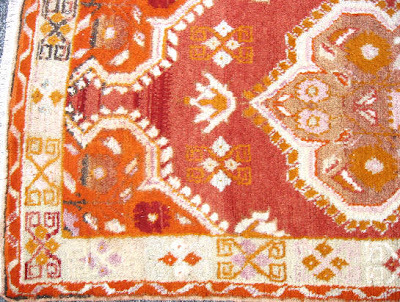 Along with his large collection of antique rugs, Atlanta-based dealer Allan Arthur offers a few vintage and recent productions, such as the Anatolian rug above. Arthur describes the luscious colors here as "cherry red, tangerine, apple green and pale lavender." 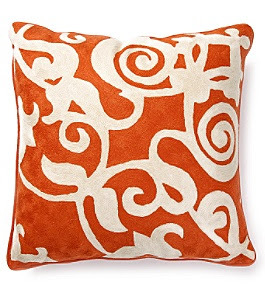 He also explains that many merchants today tend to loosely label all pale floral and curvilinear rugs made in Turkey "Oushaks," in part because Oushak, a city in Western Turkey, serves as an export hub. But technically, many of these rugs originate from places outside Oushak. Arthur is highly knowledgeable and his site has helpful resources. 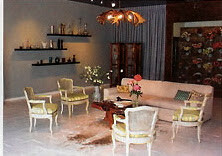 His Atlanta showroom is located inside the 14th Street Antiques Market at 530 14th St. 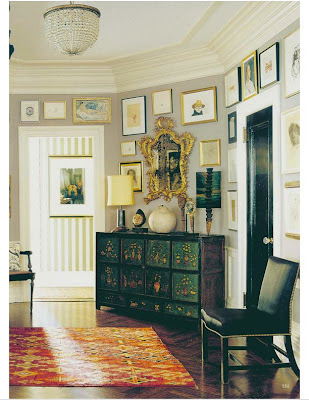 Above, a bright intricately patterned rug in the entry of Kate and Andy Spade's New York apartment, photographed by Eric Morin for the December 2006 issue of World of Interiors. 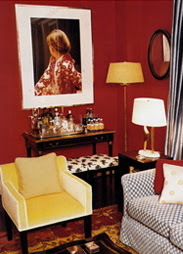 Below, a tiny glimpse of a boldly-colored rug can be seen in another of the Spade's multi-layered rooms, from Town & Country October 2004. 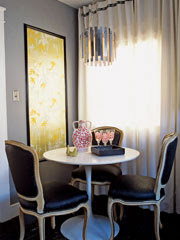 Designer Steven Sclaroff collaborated with the couple on this apartment. BTW: A great new podcast, "Village Rugs: Weaving From Memory," is available from Christie's. Visit the Apple iTunes store and type "Christie's auction house" in the search box. London dining room above photographed by Simon Upton for Elle Decor; Interior design by Blathnaid Behan. 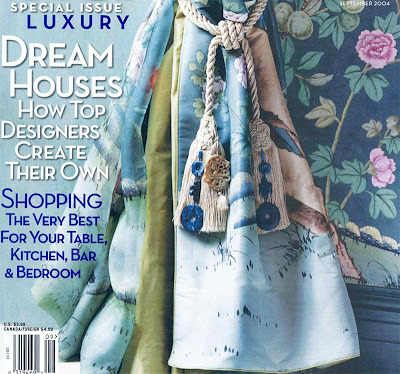 If you're not an Elle Decor subscriber, rush to pick-up a copy on Tuesday, March 13 when the oh-so-beautiful April issue hits newsstands. Homes from around the world are featured. Emma Roig's fresh Kensington dining room happens to be my favorite. A former hair stylist of mine says he has to watch The Umbrellas of Cherbourg on mute (all dialogue in the movie is sung) but, like me, he thinks the saturated colors of this critically-acclaimed French film are spectacular. The film's colors are actually so intense that the other day I found myself a little mesmerized when I saw it playing on a large plasma screen in the Kate Spade shop. 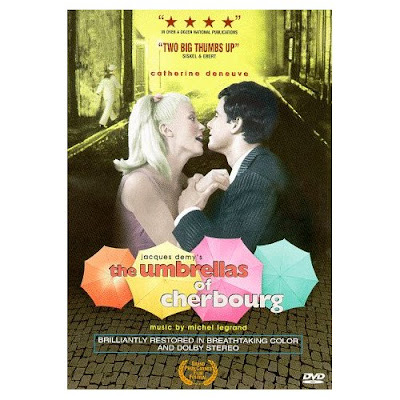 First released in 1964, The Umbrellas of Cherbourg stars Catherine Deneuve. With characters' clothes matched to boldly patterned interiors, this movie is visually unique. Definitely worth a look for anyone interested in color theory -- or anyone who just loves high-voltage pastels. Illustration above by Jacqueline Duheme, as seen in Mrs. Kennedy Goes Abroad. Below, Lee Radziwell and Jacqueline Kennedy ride elephant, Jaipur 1962. 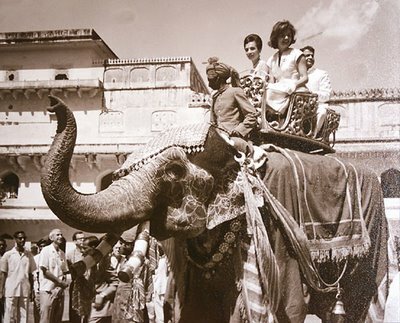 Longtime readers know I love Jacqueline Duheme's colorful series of illustrations that chronicle Jackie Kennedy's travels abroad in the early 1960s. 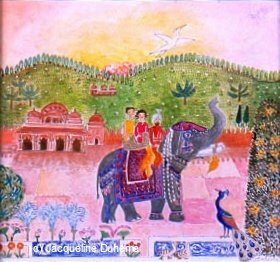 Duheme began her career as Henri Matisse's atelier assistant, and his influence can be seen in her work, but her intricately detailed paintings also seem inspired by traditional Indian miniatures. 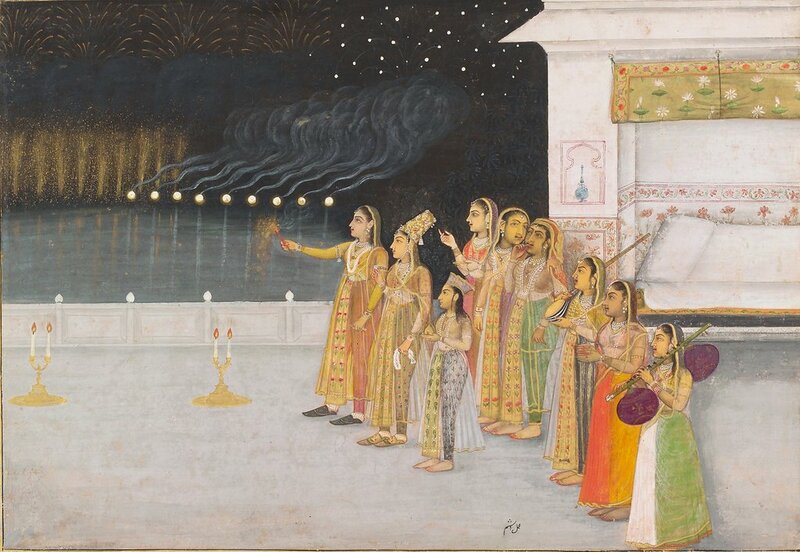 Below is an example of these exquisite Indian paintings, from Domains of Wonder, an exhibition currently on view through Sunday, March 11, at Emory University's Carlos Museum. Sumptuous pinks, greens and yellows fill most of the 123 petite paintings included in the show. Opaque watercolor and gold on paper; Late Mughal, Muhammad Shah period; or Oudh; Second quarter of the 18th century, copyright San Diego Museum of Art. Edwin Binney third Collection.